You don’t want to miss this evening of beautiful Greek music with OINOS at Dolphin Seafood, 12 Washington St. Natick, MA 01760. The space is intimate and will allow for a great “parea” and “kefi”. 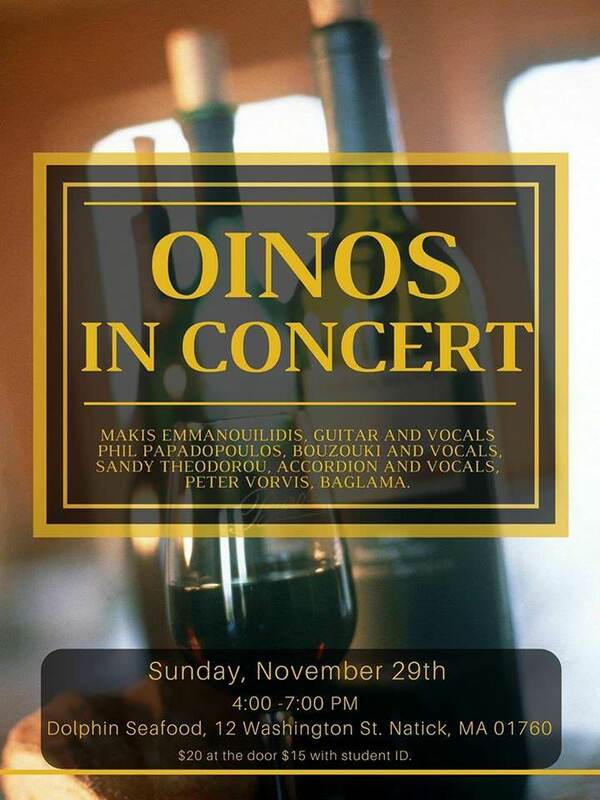 The music group OINOS, named after the ancient Greek word for wine, intends to be fun and “light” while encouraging their audiences to sing along and participate. The group was formed in order to play some original music composed by Makis and at the same time perform the “laika” songs of the 50s,60s and 70’s. The members of the group are: Makis Emmanouilidis, guitar and vocals, Phil Papadopoulos, bouzouki and vocals, Sandy Theodorou, accordion and vocals, Peter Vorvis, baglama. Entertainment fee: $20 at the door, $15 with student ID.